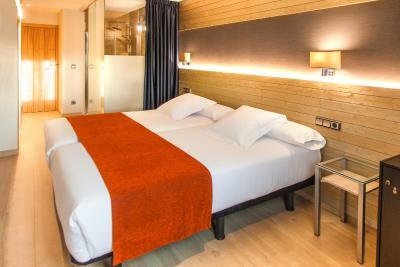 Lock in a great price for Hotel Avenida – rated 8.8 by recent guests! We were delighted with the standard of accommodation at this hotel, which we chose really because it was very convenient for the railway station. We had a more spacious and modern room than in some other hotels we stayed in, and the standard of the breakfast was excellent. Overall a very comfortable night. The service was really good, the check-in was quite easy big shout out to Maria José 👍, the bearkfast was good value and Server recommended good spot around the city. Don't miss la tortilla de patatas was so delicious. Friendly and helpful staff- more than helpful including helping us get our luggage from the car into the hotel. Highly recommend as s great value! Staff were accommodating, room itself was spacious with fridge and largest flat screen TV of several hotels/hostels visited. Easy room temperature control. Free access to a computer near reception if needed. Very nice coffee. Train station 4 minute walk. Should be 3 star plus hotel. New, modern rooms. 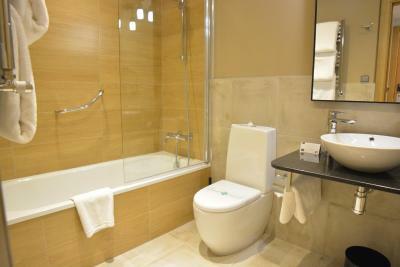 Nice bathroom with a bathtub (always a plus for us!) Great value for money. This was more of a stop for the night. We walked to the light house and along the beach. 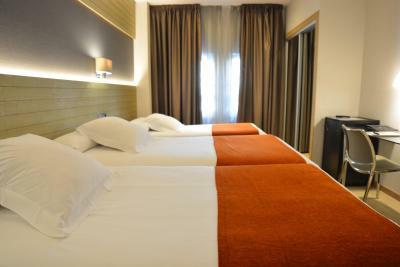 Awesome rooms with jacuzzi, very professional staff, super clean. The staff was very nice and spoke English! The room was also cozy and clean, with a big tv and mini fridge. The location was also good, next to the bus station, train station and a lot of busses. It was also close to a small mall, a lot of local pubs and shops, and even one part of the port. It wasn't that far away from the center either, about 10 minutes by bus or ~30 minutes walk. We were 3 people. Room was kind of small but clean. The beds were very comfortable. The rooms were kept very clean. The staff very healpful. The hotel restaurant was very well run. The food was excellent and very reasonable. 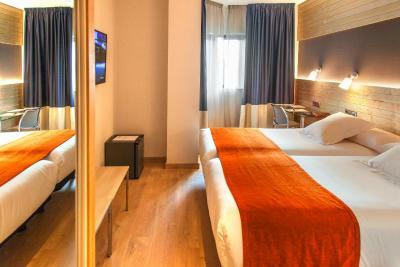 One of our top picks in A Coruña.This smart and value hotel, Superior 3-star, is located near the center of A Coruña and very near the main train station. 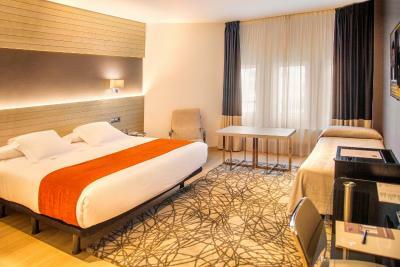 Relax in the modern and well-equipped rooms and enjoy dining in the on-site restaurant. Set in a tranquil area of A Coruña, Hotel Avenida is the ideal accommodations whether you are visiting the area for sightseeing, or on a business trip. Each of Avenida's bedrooms is decorated in a trendy, contemporary style and come complete with large work desks and lots of natural light. Stroll through the gardens surrounding Hotel Avenida and enjoy the peaceful setting. You can also sit on one of the hotel's terraces with a drink in the evening. Dine in the hotel's restaurant in the evening, where you can sample traditional Galician cuisine, accompanied by a bottle of wine. The restaurant also is well equipped for hosting business dinners or banquets. 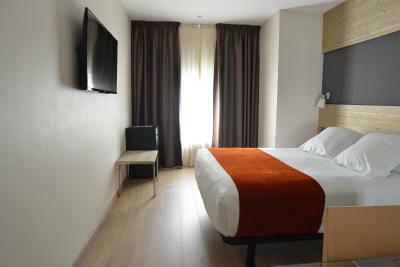 Well located 150 feet from the railway station, and 650 feet from the bus station, this is an ideal hotel for those arriving by public transport, or by car. The touristic center of the city is about a 20-minute walk from Hotel Avenida, or a short drive away. This air-conditioned room features modern décor and parquet floors. 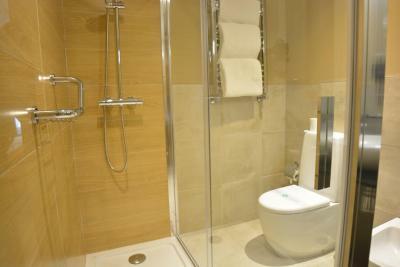 It comes with free Wi-Fi, flat-screen satellite TV and a private bathroom with a hairdryer. This air-conditioned room features a flat-screen TV and mini-bar. - A 1-hour spa pass per reservation. *Reservation in advance is needed. Great choices for breakfast, very helpful and efficient staff, spotlessly clean, good size bathroom. Easy reach of big shopping centre, railway station close by, taxis very close by to explore other places of interest and very competitive prices. Ignore Google Maps route from the station. It takes you round 3 sides of a rectangle. Use the 4th side - 2 minutes walk. Fine modern hotel very close to the railway station with close public transport into town. Dinner was good and good value for money. Parking was a little confusing to find it! No indication provided. Did not have enough mirrors ! Good breakfast. Great facilities and amenities. The location! Its next to the train station, we're coming from Lisbon. We took the train to Porto and Vigo. The staff was very friendly. I would definitely recommend this hotel! Thumbs up! Location close to train but 30 min walk to city centre. Facilities and staff. Newly renovated. Amazing staff at reception and cafeteria. Nice rooms and very comfortable. I did not like the bar restaurant, sponges and cakes uncovered is not hygienic! They were probably sitting there all day and the coffee wasn't good either. I would stay again at this hotel but I would not use the bar restaurant. 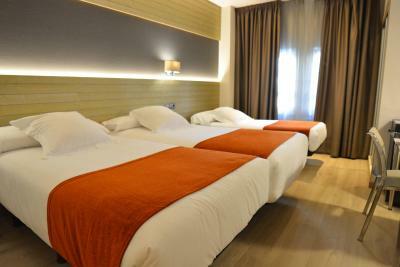 I liked the hotel location, close the train station also the prices and very clean! !